Getting Elbow Pain From Swimming? ~ Feel For The Water! Advice & Tips to Improve Your Swimming. Home » » Getting Elbow Pain From Swimming? Getting Elbow Pain From Swimming? At Swim Smooth we often talk about shoulder pain and how to avoid it. Slightly less common but equally problematic when it occurs is elbow pain - commonly called "golfer's elbow" (medial epicondylitis). Normally the reason for the pain or how to fix it isn't apparent to the swimmer, so what does cause it? 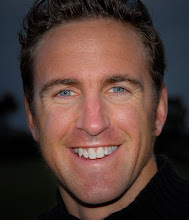 Another Problem Caused By Over-Coaching "Longer Is Better"
All through the 1990s and much of the 2000s swim coaches thought the holy grail of good swimming technique was to make the stroke as long as physically possible. Taking fewer strokes, it was argued, made the swimmer faster and more efficient. Fortunately we now understand that this is not the case and that an overly long stroke is actually less efficient. 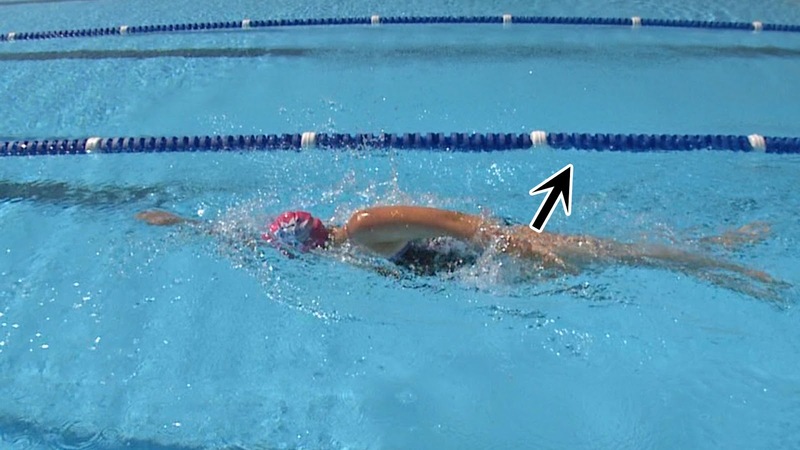 During that era of swim coaching there were two main focal points - add a glide to the front of the stroke and make sure the swimmer finishes each stroke with a strong push at the rear. We've talked a lot about the dangers of adding a glide to the front of the stroke but what about the push at the rear? The first is that just like a glide at the front, it creates a deadspot in the stroke - and so a gap in propulsion between the two arms. Water is 800 times more dense that air so this gap in propulsion means you to decelerate and lose speed. Secondly, locking out the elbow at the rear places a huge amount of stress on the elbow joint, commonly resulting in elbow pain or injury. In nearly every case, elbow pain or injury from swimming is caused by this over-emphasis at the rear of the stroke. Swimmers don't do this naturally, they're coached to do it. This produces a downward force, sinking the legs. This means you either have to kick harder to keep them up or they sink creating extra drag. So How Should We Finish The Rear Of The Stroke? From there the hand can move smoothly and continuously into the arm recovery. 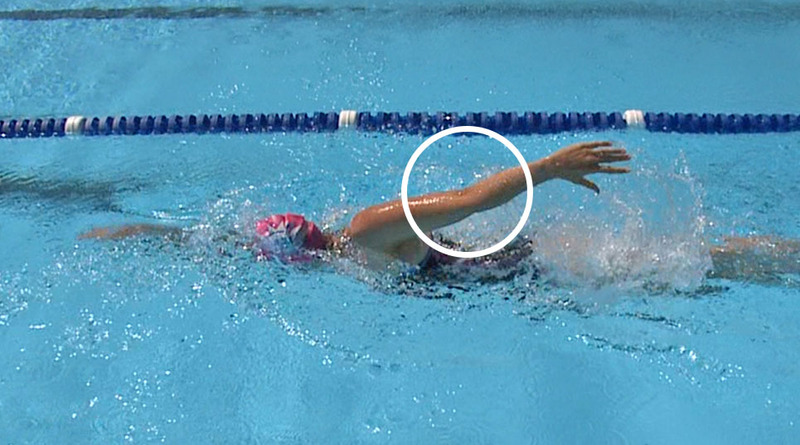 If you suffer from elbow pain when you swim then you need to move away from overly emphasising the rear of your stroke and towards a more fluid completion with the palm facing inwards. It will immediately feel a more natural way to swim and there's a lot to be said for that too. Thank you for this blog. Everything you've pointed out is true. Also, a *hugely* overlooked cause of elbow pain in swimmers (and tennis players and baseball pitchers) is improper activation of muscles starting from the opposite hip diagonally through the core to the shoulde which is connected to the elbow that then begins hurting. During the swimming stroke, the hip and glutes opposite the shoulder (connected to the elbow) must activate which results in the brain sending signals diagonally through the core and back to the shoulder, thus telling the shoulder where its place in space is. If the hip and glutes are not driving the stroke and contracting, the shoulder has no idea where it should be in space and often rolls forward. It's this rolling forward of the shoulder that then overloads the elbow. Very few physiotherapists or swim coaches realize that most elbow pain actually results from hip and core dysfunction because to diagnose misfiring of muscles is both subtle and subjective. Coaching and medicine function on things that are obvious and objective. So, look further backward in the movement chain for causes of elbow pain. Excellent article. I will pay attention at how I push at the rear. Thanks ! It seems I've developed a case of cupital tunnel in both elbows. This article, and the comments, will come in handy. However, does anyone have any suggestions, besides surgery, to correct the problem? A good massage therapist or physical therapist would be well worth trying before committing to surgery. The Red Mist Set Ridden On A Bike?